The introduction of copper metallization and low dielectric constant materials into chip manufacture is the most difficult interconnect challenge of modern microelectronics.Current state-of-the-art chips have interconnects, or on-chip "wiring," as narrow as 150 nm to 180 nm with height to width ratios as great as 2:1. The filling of such trenches with copper can currently be accomplished by electrodeposition, but roadmaps for the semiconductor industry state needs for trenches as narrow as 50 nm with a 10:1 aspect ratio. Researchers at NIST are providing the fundamental understanding required to achieve these goals. Models of the mechanism behind superfilling during copper electrodeposition, and associated computational and measurement tools developed at NIST are addressing the needs of the microelectronics community and are already in use by industry to streamline the development of electrodeposition baths. The semiconductor industry has recently shifted from the use of aluminum for interconnects, or on-chip "wiring," in integrated circuits to copper because of its lower resistivity and higher electromigration resistance. Electrodeposition has been found to be the best means to deposit copper into the narrow, deep trenches used for circuitry, since "superconformal" deposition is possible which fills very narrow trenches without porosity. An electrolytic copper linewidth of 180 nm is now commonly found in IC fabrication. Extension to the narrower and deeper lines needed in the next generation of IC requires industrial development of new electrolytes and deposition schemes. Development of plating baths able to deposit in trenches with aspect ratios (height/width) as high as 10:1 is limited by the necessity of time-consuming, resource-intensive evaluations with actual nano-scale patterned substrates. Such experiments require microstructural characterization by focused ion beam (FIB), scanning electron microscopy (SEM) and transmission electron microscopy (TEM) on an individual basis. NIST efforts address metrology needed for superconformal deposition that minimizes this time-consuming experimental work. The mechanism responsible for superconformal electrodeposition of copper in high aspect ratio features has been determined. Simulations from a model based on this mechanism have been shown to predict results of electrodeposition filling experiments in trenches as small as »90 nm wide and »450 nm deep. No fitting parameters are required to model this behavior. This work has built upon two recent Metallurgy Division discoveries. First, an electrolyte was developed that yields superconformal electrodeposition of copper. Second, voltage cycling-induced hysteresis of copper deposition rate on flat copper specimens was shown to be indicative of the ability of an electrolyte to yield superconformal deposition. Superconformal deposition was shown to occur only when both an inhibiting additive and an accelerating additive are present in the electrolyte. Kinetic parameters for particular electrolytes are obtained from the cyclic voltammetry described above. These kinetic parameters describe the rate at which the accelerating additive accumulates on the copper surface, displacing the inhibiting additive that retards local copper deposition. They also quantify the impact this accumulation has on the local copper deposition rate. Figure 1. 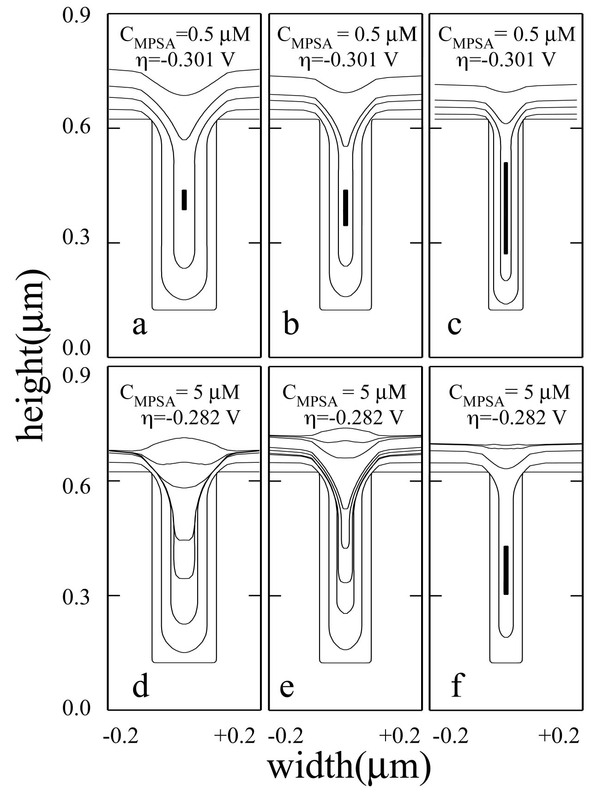 (top) Experimental current-voltage curves for copper deposition on a flat copper substrate in electrolytes containing a deposition inhibiting additive plus varying amounts of an accelerating additive. Note the hysteresis and the saturation at high concentrations. (bottom) Fit of accelerator accumulation used to extract kinetic parameters for the Curvature Enhanced Accelerator Coverage (CEAC) model of superfill. fine features thus increases as the surface area decreases during copper deposition. This, in turn, accelerates copper deposition. The positive feedback cycle results in filling of the trench from the bottom upward, i.e., superconformal deposition. The finer the feature, the more important area change can be - it requires an appropriately designed electrolyte composition and appropriate deposition conditions to take full advantage of this effect.  Explained the significance for superconformal deposition of hysteresis in deposition on flat copper substrates. 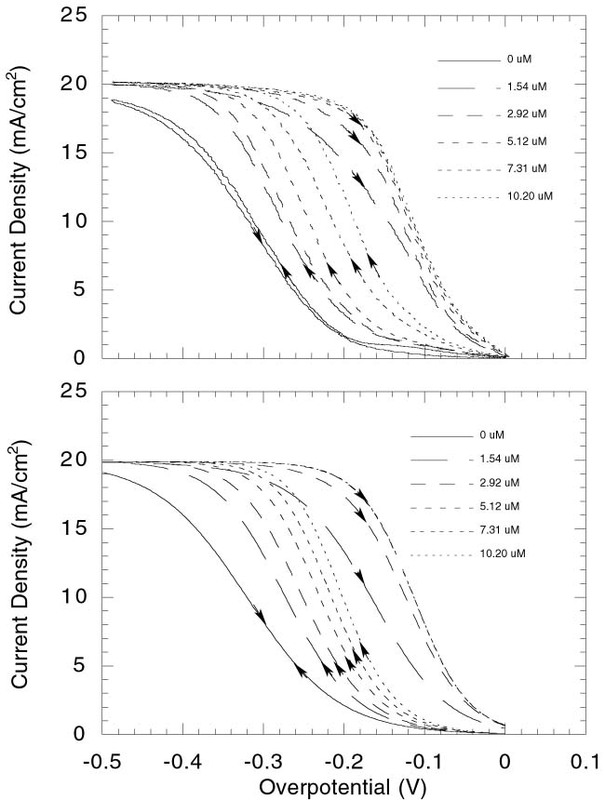 Figure 2 (Left side) Superfill results for accelerator concentrations of (0, 0.5, 5 and 40) µmol/L (top to bottom). A window for superfill exists around 5 µmol/L concentration. (Right side) Predictions of the newest computer code for the three finest features at (0.5 and 5) µmol/L (top and bottom). Inclusion of diffusional effects results in voids indicating failure to fill. Simplifications in the first NIST model of superfill resulted in seams in features that failed to fill.  Developed the Curvature Enhanced Accelerator Coverage (CEAC) model that explains how accumulation of accelerator is impacted by changing area at the bottoms of fine features and how this effect causes superconformal deposition.  Developed computer codes to predict superfilling of fine features using only the results of cyclic voltammetry studies with flat copper substrates. The most recent of these codes describes diffusion of the cupric ion and accelerator through the electrolyte, interface kinetics affecting transfer onto the copper/electrolyte interface, motion of the interface, and the impact of interfacial area change on accelerator concentration and local copper deposition rate. This information has been conveyed to U.S. industry, academia and other national laboratories through eight presentations given in professional society meetings attended by industry representatives from electrolyte suppliers, analytical tool, plating tool and chip manufacturing industries. 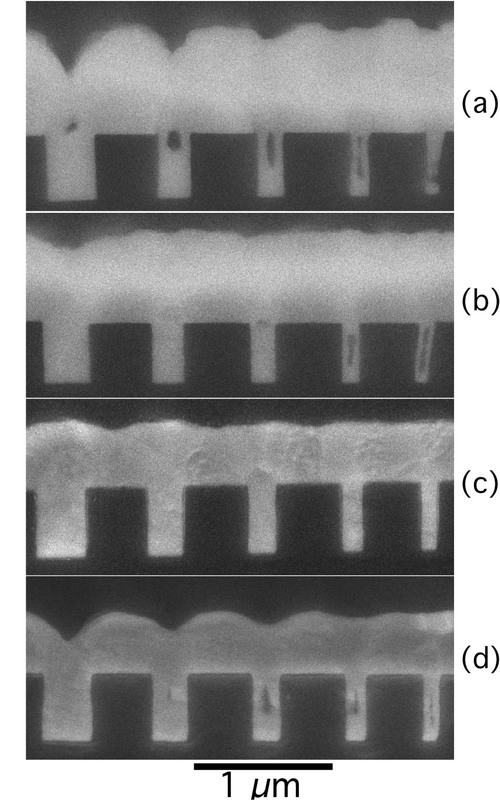 D. Josell, D. Wheeler, W. H. Huber, and T. P. Moffat, "Superconformal Electrodeposition in Submicron Features," Phys. Rev. Lett. 87, 016102 (2001). T. P. Moffat, D. Wheeler, W. H. Huber, and D. Josell, "Superconformal Electrodeposition of Copper," Electrochem. and Solid-State Lett. 4, (4) C26 (2001). Increasing global concern about the environment is bringing regulatory and consumer pressure on the electronics industry in Europe and Japan to reduce or completely eliminate the use of lead in most products. Worldwide, the microelectronics industry has made great progress toward application of lead-free solders in the relatively benign conditions of consumer electronics. In 2001, the National Center for Manufacturing Sciences (NCMS) completed the High Temperature Fatigue Resistant Solder Project to address the industrial need for lead-free solders in harsh environments, such as encountered in automotive under-the-hood applications. 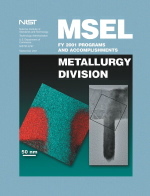 NIST played a leadership role in this research project, chairing the alloy task group and providing definitive, timely materials data and critical analyses needed for evaluating candidate solders, leading to the development of new lead-free solders with excellent performance, outperforming industry-standard compositions. Microelectronics assembly has, from its infancy, been based on tin-lead eutectic solder, a mixture of tin and lead that melts at 183 °C. In recent years there has been an increasing need within the avionics, telecommunications, oil exploration, and automotive industries for solders which perform reliably at ever-higher temperatures, temperatures which approach the melting point of tin-lead eutectic. Such harsh environment applications require solders with melting points higher than that of tin-lead eutectic in order to achieve the required reliability. In addition, recent legislative and marketing pressures in Europe and Japan have pushed U.S. manufacturers to pursue lead-free solders for all microelectronics applications, leading to the double challenge of developing high temperature, Pb-free solders. 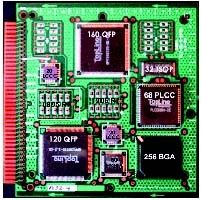 In 1996, the National Center for Manufacturing Sciences (NCMS) initiated the High Temperature Fatigue Resistant Solder Project to address the need for high temperature, high reliability solders in response to a need identified and defined by a number of companies in the microelectronics, automotive, avionics and telecommunications industries. The resulting consortium, consisting of eight industrial corporations, academia and NIST, has completed its four-year program. Consortium members include Allied Signal, Amkor Technologies, Delphi Delco Electronics Systems, Ford Motor Company, Heraeus Corporation, Indium Corporation, Johnson Manufacturing, Rockwell International Corporation, Iowa State University, and NIST. 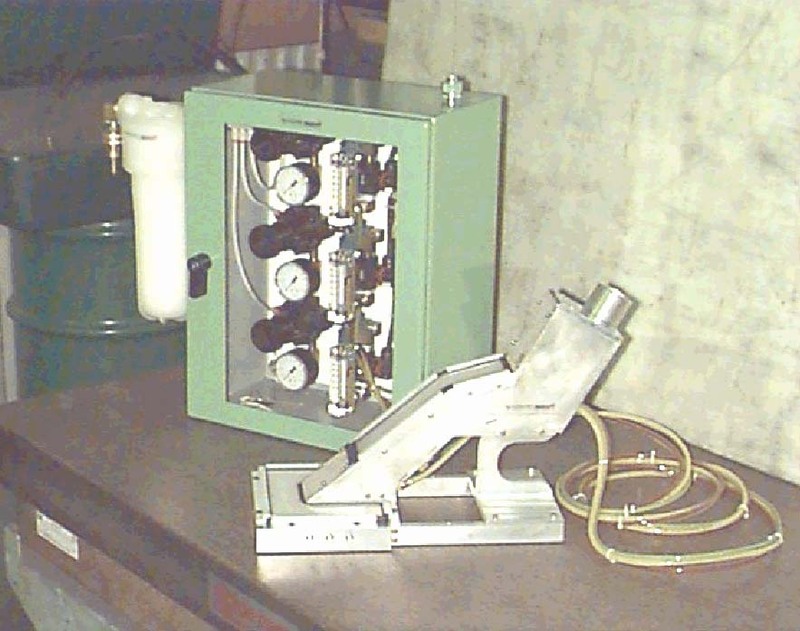 The goal of the project was to determine whether highly reliable, nontoxic, cost-effective substitutes could be found for high lead and Sn-Ag eutectic solders in harsh environments.This goal required gaining extensive knowledge of the properties and manufacturability of alternative solder alloys. The project members initially identified about 200 candidate solder compositions. Experimental measurements on 52 of the alloys were made to characterize melting and wetting behavior and reactions with substrates during prolonged exposure at high temperature. A thermal-fatigue screening test was run on 12 of the most promising Pb-free alloys. From these candidates, 7 alloys were chosen for full scale manufacturing and reliability trials, utilizing a variety of surface mount components cycled up to 160 °C. Figure 1. Plastic leaded chip carriers on ceramic (top) and polymeric (bottom) substrates assembled with Pb-free solders and surface finishes.  Six lead-free alloy compositions were identified that exhibit fatigue performance during -55 °C to +160 °C cycling of a wide range of components which is superior to the industry standard eutectic Sn-Ag alloy.  The seven lead-free alloys cycled with ball grid array (BGA) packages through 0 °C to +100 °C and -40 °C to +125 °C cycling all outperformed Sn-Pb eutectic solder.  Manufacturing of these alloys and generation of solder pastes does not present any special problems.  Present manufacturing equipment can be used to build assemblies in many cases.  Alloy costs will not be a major factor. 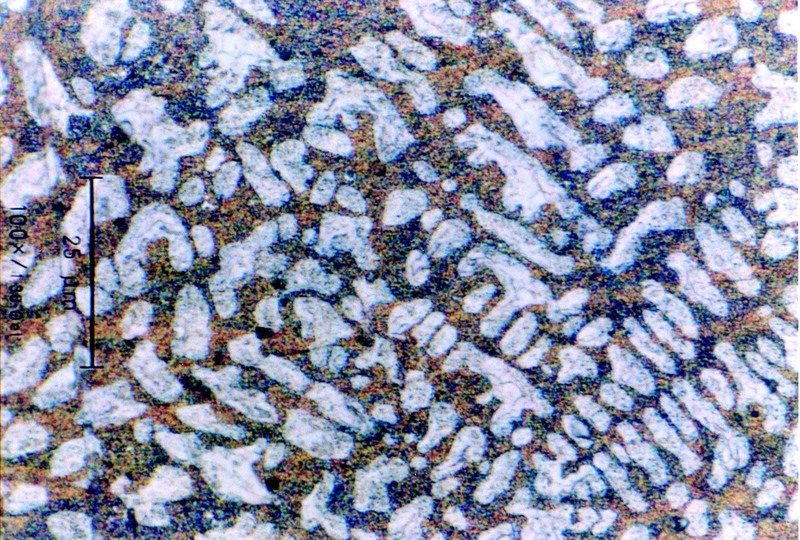 Figure 3 Microstructure of an experimental alloy. "NIST personnel brought unique skills and expertise to both NCMS projects [the Lead-Free Solder Project, and the High Temperature Fatigue Resistant Solders Project]. Without the support from NIST, both these projects would have extended over a longer period of time and would have been more costly to the project's industrial partners." Figure 2. Reliability Test Vehicle used to test manufacturability and thermal fatigue resistance of a variety of surface mount components on printed circuit boards. NCMS High Temperature Fatigue Resistant Solder Project Final Report, NCMS, Ann Arbor, MI, 2001. Frank W. Gayle, "Fatigue-Resistant, High Temperature Solder," Advanced Materials & Processes 159 (4), April 2001, p. 43-44; Frank W. Gayle, et al., "High Temperature Lead-free Solder for Microelectronics," JOM, June 2001, p. 17-21. Major research efforts within the U.S. auto industry are driven by the need to reduce the weight of future vehicles to meet U.S. Council for Automotive Research (USCAR) and Partnership for a New Generation of Vehicles (PNGV) goals. This can most readily be accomplished by the substitution of lightweight materials for the heavy materials currently used. With the completion of this project, NIST has assisted industry in developing a low cost powder processing technology for aluminum alloy and particle-reinforced aluminum parts that may be substituted for iron-based powder metallurgy products. Efforts to mass produce acceptable parts using press-and-sinter and direct powder forging are underway. The NIST part of this effort focused on modeling each step in these consolidation processes from powder to fully dense part. Modeling provided a basis for rapidly designing successful processes. is an integral and very critical aspect of this program," and "[NIST's] impact could eventually extend well beyond this particular project." In collaboration with the Micromechanics Centre at Cambridge University, a physically based constitutive law for consolidation of reinforced powder was developed. 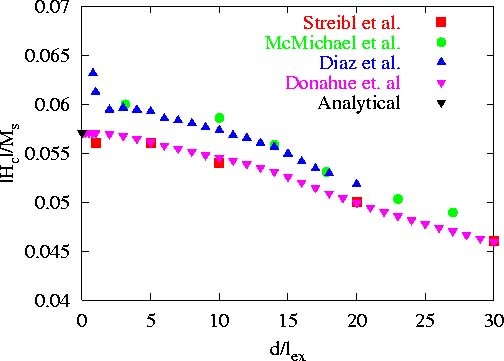 Its validity was tested at NIST on powders relevant to the USAMP program and found to accurately describe the consolidation behavior of reinforced powders. This model was implemented in a finite element model to predict the behavior of parts having complex shapes. USAMP funded a small business to develop the model for the specific shapes of interest to the program. The computer-modeling package is now available in a user-friendly, commercially supported form. Figure 1. Parts targeted by the USAMP project on Low Cost PM Technology for Particle Reinforced Aluminum. Figure 2. Finite Element Model of Gerotor Die filled with powder that is modeled using the constitutive equation and data developed in this project. 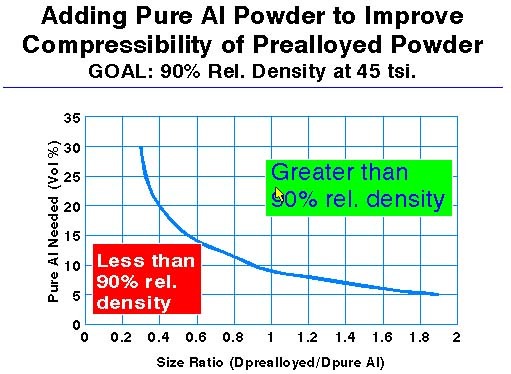 amount of aluminum needed to reach a relative density of 0.90 as a function of the size of the soft aluminum powder particles relative to the hard powder particles under a pressure of 620 MPa (45 tsi). The figure can be easily changed to address particular industrial requirements. It emphasizes the importance of particle size on the resulting behavior. Figure 3. 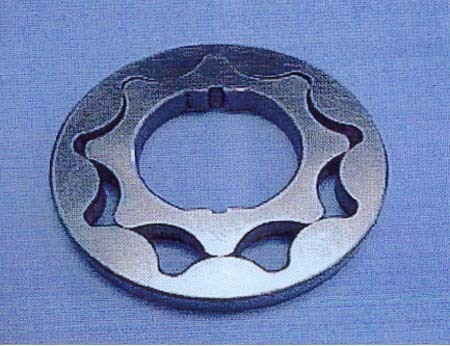 Effective of pure aluminum on compressability of prealloyed powder. Figure 4. Fluidized feedshoe and associated equipment for improving the flowability of fine or irregularly shaped powders into die cavities. powders for tools. The fluidized feedshoe is now commercially available from a powder press manufacturer as an accessory to their presses. It is being used by a number of U.S. companies to make parts using fine powders or better parts using existing powders. One unexpected outcome of the technology is shown in Figure 5 _ improved part uniformity. 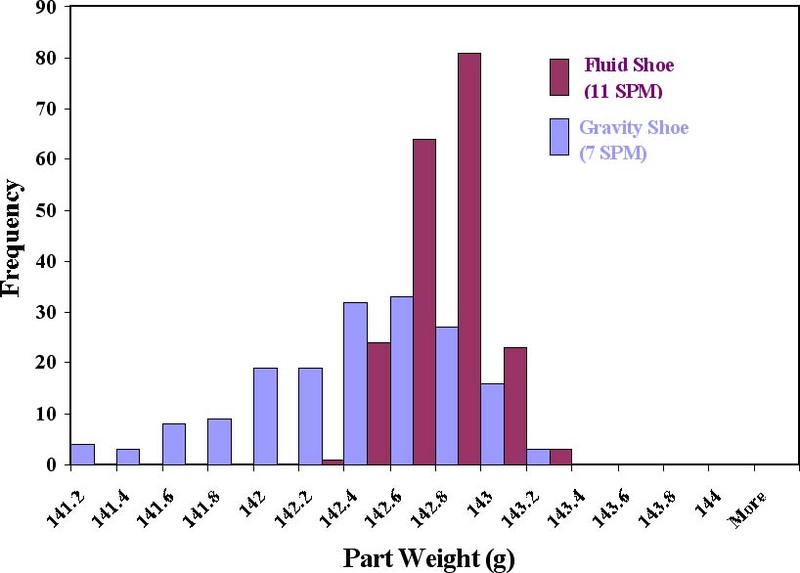 This figure shows the improved mass uniformity using the fluidized feedshoe. This mass uniformity translates into improved dimensional tolerances for PM parts. It also permits more rapid feeding and increases productivity. Figure 5. Weight distribution for gears made with and without the fluidized feedshoe technology. Computational micromagnetic modeling is the dominant method used to calculate magnetization patterns and dynamics in materials and devices on length scales from nanometers to several micrometers. The demand for accurate micromagnetic modeling is accelerating as the industry wide trend of over 60% per year increase in bit density for hard disks creates increasing demands on our ability to predict and control the magnetization in materials and devices. Development of new magnetic devices including magnetic random access memory (MRAM) increasingly depends on the behavior of magnetization on nanometer length scales. Our activity in computational micromagnetics, started in 1995, is designed to facilitate testing of micromagnetic computer codes by specifying and publicizing a number of standard problems and then computing, collecting, comparing and publishing solutions to these problems. Micromagnetic modeling is used to compute magnetic domain structure and dynamics in magnetic materials starting from sample morphology, materials properties, and applied fields. This type of modeling is a very important part of device design, particularly for read heads in hard drives and magnetic random access memory (MRAM) cells. Micromagnetic modeling has also contributed a large amount to our understanding of recording processes and noise in magnetic recording media. Our involvement in standard problems was designed to fill a need in industrial and academic labs for a method to check the accuracy of micromagnetic modeling software, usually developed independently in each lab, and tested by parts, energy term by energy term. Beyond finding "bugs" in software, the standard problems also provide benchmarks for modeling practice which can help to avoid errors introduced by overly coarse discretization, or loose convergence criteria. The standard problems were one of two action items recommended in the initial workshop of the micromagnetic modeling activity group (mMAG) that drew approximately 100 attendees. This workshop was held as an evening session at the 1995 INTERMAG conference, and was sponsored by MSEL's Center for Theoretical and Computational Materials Science.  Geometries and materials properties should be similar to "real-world" applications.  Specifications should be loose enough to allow different computational methods to be used, but tight enough to ensure that results can be meaningfully compared.  The scope of the problem should be small enough that it would not be too expensive in manpower or computational time to compute a solution.  The problems should be significant enough to allow solutions to be published in the usual scientific journals. found to have wide disagreement, we quickly decided to protect the contributors by collecting results anonymously. Nine solutions were collected and posted on the mMAG website with widely varying results. While Standard Problem #1 may be regarded as a failure regarding its use in checking micromagnetic software, it remains important as the first attempt at a public standard problem in micromagnetics, and as a computational challenge. Standard Problems #2 and #3 were developed from discussions at a second mMAG workshop held as an evening session of the 1998 Joint MMM-INTERMAG conference. Standard Problem #2 is a variable-sized bar of material with aspect ratios of 5:1:0.1. All lengths are expressed in units of the magnetostatic exchange length, which is a function of the material exchange stiffness constant and the magnetization. The results collected for comparison are the coercive field and the remanant magnetization as a function of the width of the rectangle. Four solutions for Problem #2 have been collected and posted on the mMAG website. Three of these results were first presented at the MMM'99 conference in a special evening session on micromagnetic standard problems. The attendees, numbering more than 100, were delighted to see good agreement between results calculated independently and by different methods. The fourth Problem #2 result is our revision of our earlier result and an analytical result for the coercivity in the limit of a small particle. A comparison of coercivity values calculated for Standard Problem #2. Standard Problem #3 is specifically designed for 3-D calculations. The object is to calculate the minimum energy magnetization configuration for a cube of material with some uniaxial anisotropy. 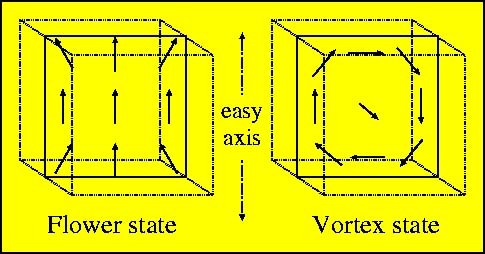 For small cubes, the minimum energy configuration is a "flower" state, and for larger cubes, the expected minimum energy state is a "vortex" state. The result collected for comparison is the critical length of the cube edge for which the energies of the two states are equal. 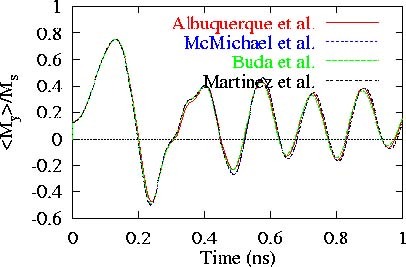 One of the submitted results revealed a surprise "twisted flower state" which has lower energy than either the flower state or the vortex state. Diagrams of the flower state and vortex state from the specification for Standard Problem #3. Standard Problem #4 is designed to test dynamic calculations based on Landau-Lifshitz-Gilbert equations of motion. The details of magnetization dynamics are becoming more important for magnetic recording as data rates increase, and for MRAM development, the details of switching behavior are critical. In Problem #4, switching is calculated for a 500 nm x 125 nm x 3 nm rectangle of Permalloy starting from an equilibrium state in zero applied field. One of two specified applied fields are turned on to induce switching, and the magnetization dynamics are traced as a function of time. For one applied field, the magnetization rotates in the same direction everywhere in the sample, but for the other, the switching is more complicated, with rotation starting in one direction near the ends of the bar and in the other direction in the middle. Snapshot of the magnetization during reversal (a) and (b) magnetization dynamics from Standard Problem #4. These micromagnetic standard problems provide computational physicists and engineers in industry and academia with benchmarks for micromagnetic software development and micromagnetic modeling practice. By assuming a leadership role in the field, by providing standard problem specifications and by providing electronic access to submitted solutions including our own solutions, we have raised the quality of micromagnetic modeling, and we have provided a means to assess the reliability of micromagnetic modeling results for modelers and for their customers. NIST could not have made these standard problems without the contributions of colleagues across the globe, especially in Europe, who computed and provided solutions to the standard problems. Temperature and velocity measurements of particles and droplets provide important process parameter data for modeling and control of the Thermal Spray (TS) coating process. Accurate measurement of particle temperature using non-contact temperature sensors depends on the use of appropriate sensor calibration procedures. In this project completed this year, we demonstrated several methods for calibrating two-color optical pyrometers including a high temperature blackbody and a tungsten ribbon standard lamp as calibration sources. 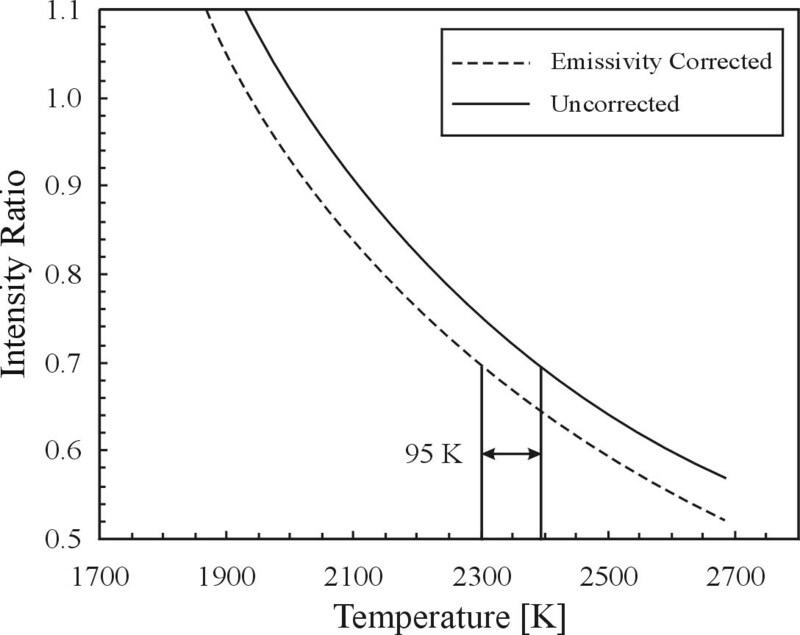 Comparing the different methods shows that the absolute temperature and wavelength-dependent emissivity of any non-blackbody calibration source must be well known to obtain an accurate sensor calibration. Further, emissivity data on individual heated particles were shown to improve the accuracy of particle temperature measurement by two-color pyrometry. In the air plasma thermal spray (TS) process for producing coatings, solid particles are injected into and heated by a plasma jet. From the beginning of the injection process through interactions with the plasma jet, the particles will have wide ranges of temperatures, velocities and trajectories that then translate into a microstructure as the impinging particles solidify to form the coating layer. Particle diagnostics within the TS plume are favored as a means of improving process reproducibility because they yield information on both the physics of the coating process itself and the process variability. TS particle sensors fill two roles. They are used in quality control operations to "tune" thermal spray torches to ensure consistent coating deposition. They are also widely used in thermal spray research, including developing parameter sets for new spray materials, evaluating improved spray torches, and studying relationships between processing conditions and coating properties. Such diagnostics make rational process improvement possible, a difficult endeavor when only process settings, such as torch power or gas pressures, or a final coating property can be measured. These important particle data are provided by non-contact optical temperature and velocity measurements from sensors and software that process light intensity readings from particles within the TS plume. Two-wavelength ratio pyrometry is usually employed for measuring particle temperatures because it is insensitive to particle size, absolute emissivity and particle position within the sensor field of view. It requires only that the particle emissivity not vary over the operating wavelengths of the sensor, known as the graybody assumption. Several approaches are now available: 1) Single particle, non-imaging sensors that collect data one particle at a time and average the results from several particles at the same location or, by moving the sensor position, within a defined area; 2) Particle ensemble, non-imaging techniques that acquire data related to some average temperature and velocity of the particle stream; and 3) Imaging pyrometry that measures multiple individual particles simultaneously by focused imaging of a large volume of the spray plume. Temperature measurement using these optical techniques requires a calibration procedure to provide the appropriate coefficients for conversion of the measured light intensities to temperature values. discussed. At the recent workshop on Thermal Spray Process Reliability held at NIST in January, 2001, the consensus was that the reproducibility and reliability of TS coatings need to be improved in order to realize the full benefits of this technology. During the Thermal Spray Process Reliability workshop, specific questions were raised concerning the calibration of particle temperature sensors, and how the properties of the particles being measured (e.g., composition, oxidation, etc.) affect the accuracy with which temperature is determined. In response, the Metallurgy Division has taken steps to outline recommended calibration procedures for thermal spray particle temperature sensors and to provide particle emissivity data for improving temperature measurement accuracy. Current work on calibration procedures has involved evaluating the use of tungsten standard ribbon lamps as calibration sources for two-color pyrometers. Tungsten lamps are used because they are readily available, but because of their deviation from graybody behavior they are not as suitable as an ideal blackbody calibration source. Errors caused by the deviation from graybody behavior are shown in Figure 1. They can be corrected using tungsten emissivity data available in the literature, or by direct measurement of the emissivity of the lamp by spectroscopy. these corrections using literature data is evaluated by comparing the resulting calibration to calibrations obtained using a blackbody. With the transfer of these results throught the technical literature, our project on Thermal Spray Processing has now been successfully completed. Figure 1. This figure shows the effect of the deviation from graybody behavior of the calibration source for a two-color imaging pyrometer. Figure 2. This graph shows the error associated with the use of radiance temperature rather than true temperature in the calibration of a generic two-wavelength pyrometer operating at l1 = 700 nm and l2 = 900 nm. The calibration source has a normal spectral emissivity of e = 0.43. Market and regulatory pressures are driving the automotive industry to develop and use new materials and manufacturing methods while competitive pressures are forcing them to keep costs low and reduce the time required to bring a new vehicle from concept to market. Current automotive production technology has evolved around stamping of relatively low strength steel to form automotive body panels and components. While this approach was acceptable when designs and materials were not changing dramatically, this process of die design and tryout may limit U.S. automakers' abilities to utilize new materials in their designs or to bring a new design rapidly to market. NIST has been working with the automotive industry to improve the die design process and reduce die development and tryout costs. One area that has long been a concern to the auto industry, but has become a major concern due to the increasing pressure to use lighter materials and reduce die development time and costs, is springback. 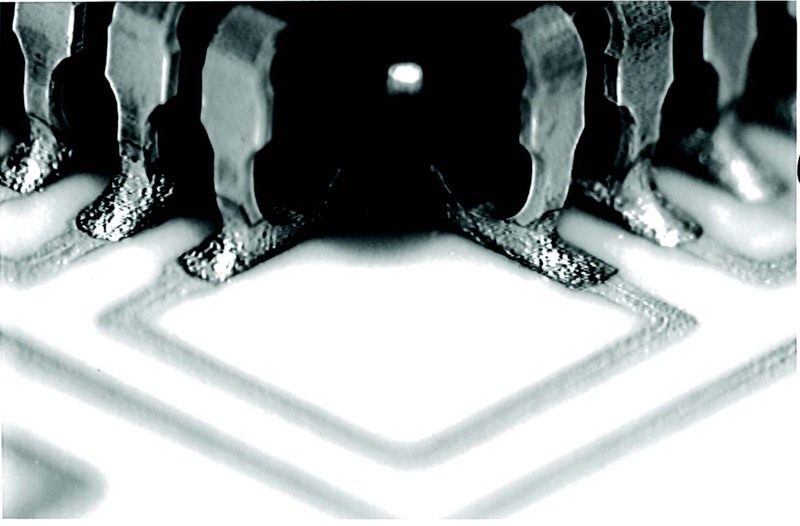 When the material being formed is a low strength material, springback from the die face following stamping will be relatively small and can be accounted for by experience and during die tryout. This sitation is no longer the case - new, higher strength steels and aluminum alloys have greater springback magnitudes; designs of increased complexity are often accompanied by unpredictable springback magnitudes and directions; and demands continue for reduce time to market. These factors point to the need for spingback to be addressed earlier in the die design, development and tryout process. The industry thus needs better predictive models based on a sound fundamental understanding of springback phenomena and appropriate measurements, standards, and data. 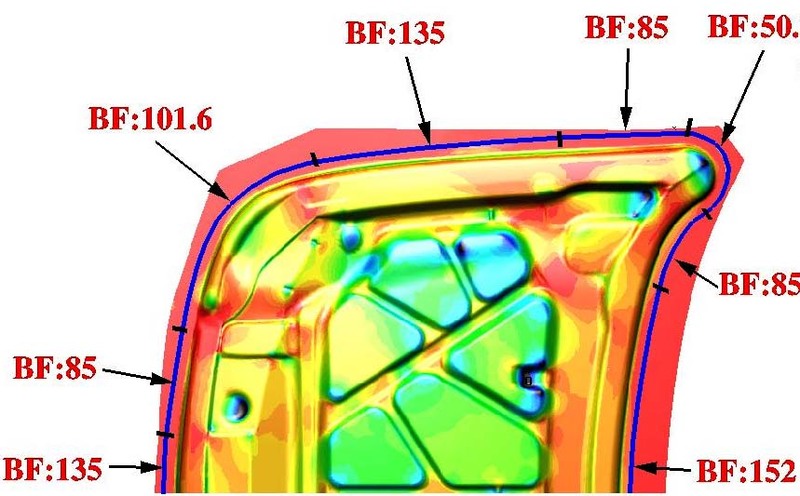 In response to this need, a consortium of aluminum and steel producers, a software company, and the three automotive manufacturers and their suppliers received support from NIST for 5 years to develop finite element software that can predict springback. The resulting ATP Springback Predictability Project (SPP) greatly reduced the uncertainty in springback predictions by finite element models and brought a higher level of understanding of springback to the sheet metal forming industry. The ATP/SPP concluded in October 2000. Figure 1. Plaque given to NIST staff that presented research results to SPP during the ATP funded phase. Figure 2. 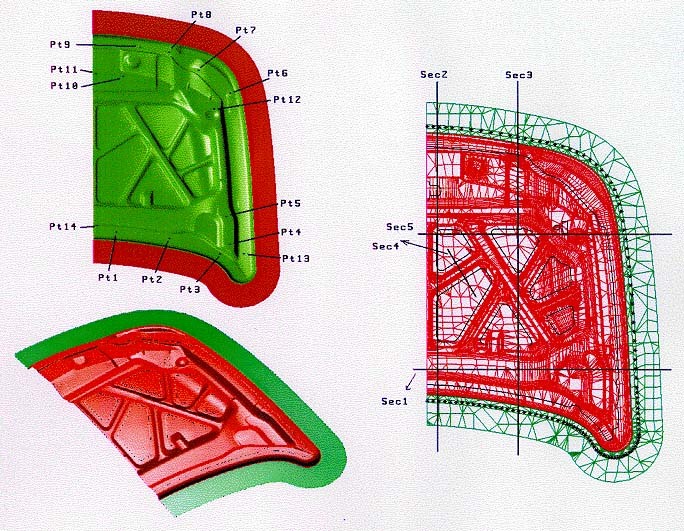 The inner panel of a car hood was one of the components targeted by industry for in-depth investigation of its springback behavior.  A model based on percolation theory was derived to describe and predict the movement of dislocations through a work-hardened microstructure. 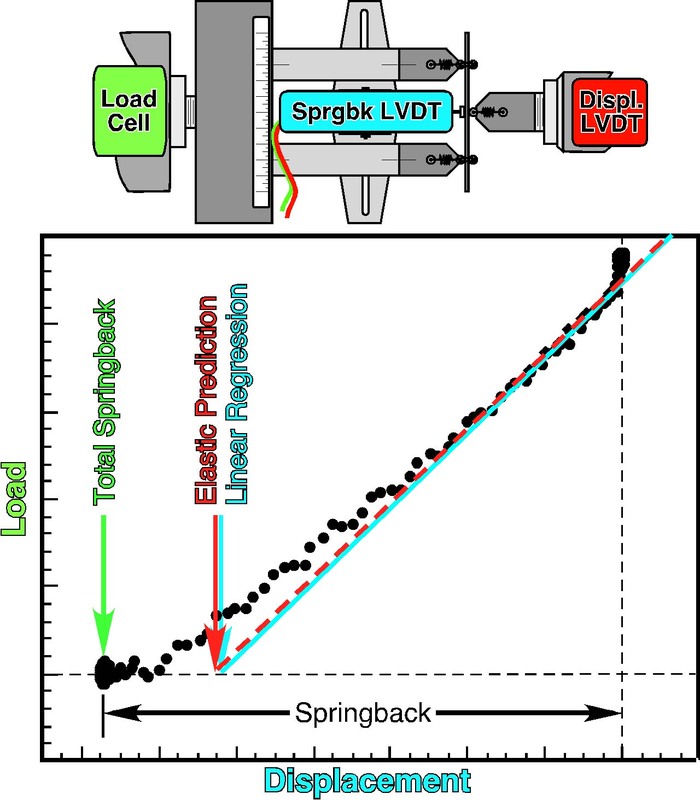  Analyses and experimental measurements demonstrated the importance of anelastic effects in plastic deformation and springback.  A new experimental technique, ultra small angle x-ray scattering (USAXS) imaging, was shown to hold promise as a useful tool for studying dislocation structures in situ. When a USAXS scan is made, the data are in the form of a slit-smeared scan through a single-direction in reciprocal space. Once a scan is made, interesting features can be identified and the analyzer crystals can be set to a specific location on the scattering curve. The sample can then be imaged through the analyzer stage. What makes this technique potentially useful is that USAXS imaging can select weak scattering components (such as dislocations) and form the image from just these components.  The influence of microstructural and compositional differences on the roughening rate during uniaxial straining was determined. A generic model for deformation-induced surface roughening was developed.  A biaxial test facility was set up at NIST to generate well defined multiaxial strain states to simulate forming conditions and develop standard measurement methods.  A well attended conference on the fundamentals of dislocations and plasticity was held at NIST to provide U.S. industry with the most up-to-date science. Figure 3. Springback measured in 3-point bend showing linear and non-lined components. 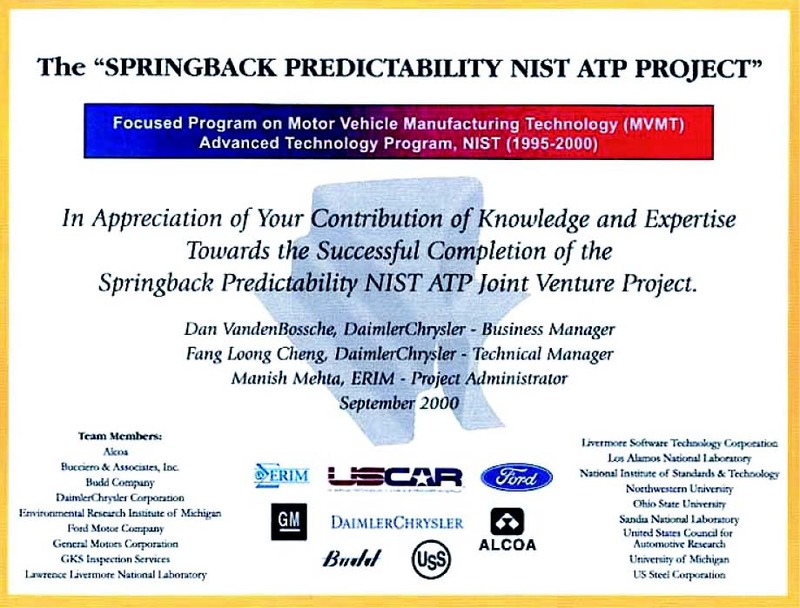 The Springback Predictability Project and joint venture partnership was considered so successful that industry decided to continue its activities with their own funds after ATP support ended. A poll was taken of the industrial members to decide the assignment of priorities to a list of 17 activities. Continued interaction with the NIST forming research effort was ranked second highest in priority.  The conclusion that anelastic recovery may be able to account for this remaining uncertainty was well received by the SPP members. 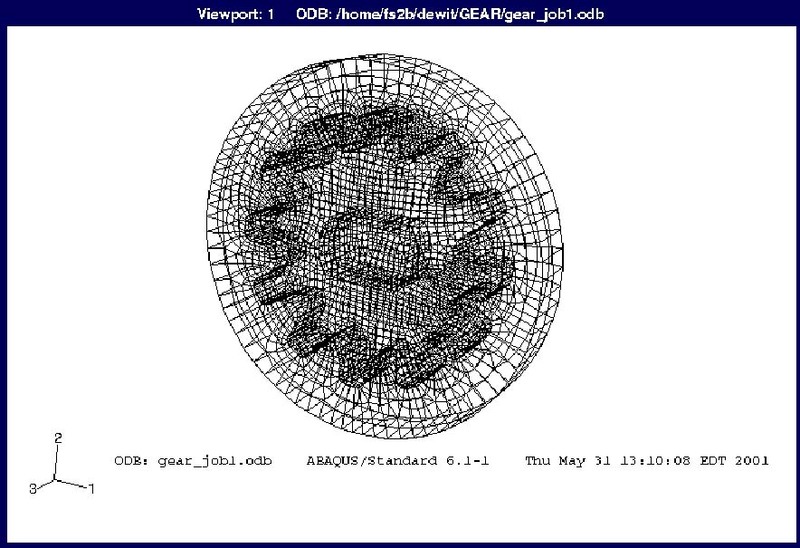 To enable obtaining a better understanding of the role of anelastic deformation in springback and dislocation dynamics in surface roughening, a dynamic mechanical analyzer was purchased. This system is capable of testing mechanical testing at frequencies up to 200 Hz and temperatures from (_150 to 600) °C with a strain resolution of 1.0 nm. This system can be used for dislocation damping (internal friction) measurements, creep, stress relaxation measurements, and anelastic strain recovery measurements. This system will enable NIST to relate fundamental dislocation structures and dynamics to the deformation behavior important to the forming industry.  We will participate in two other industry-led consortia: Warm Forming of Aluminum and Active, Flexible Binder Program for Metal Stampings. Our involvement will be to investigate the elevated temperature formability of sheet metal by upgrading our biaxial tester to carry out tests on heated metal. The role of roughening on friction will also be pursued to improve predictability. Figure 4. Inner panel of car hood. Commercial alloys rarely consist of only two elements and some contain up to 10 elements. In addition, many important industrial processes rely on diffusion to control the formation and dissolution of precipitate phases within a matrix or at an interface. The development of thermodynamic and diffusion databases enables the extrapolation of these properties from binary and ternary systems to needed higher order systems. NIST's development of such databases for Ni-base superalloys allows the modeling of various processing applications. The approach has been shown to give reasonable predictions for complex alloys and provides a compact storage method for vast quantities of data. During the last decade, researchers from the Metallurgy Division have collaborated with scientists from universities and industry on several projects with emphasis on modeling tools for the design and manufacture of superalloys. Structural parts made from superalloys not only must withstand extended periods of service at high temperatures, but also must tolerate severe environmental conditions, such as highly corrosive fumes from a jet engine. In addition to the increased performance required for aerospace applications, the performance demands for land-based energy applications are also increasing. The traditional approach for development of a new alloy relies on the knowledge and experience of the engineer, which can be costly due to the significant amount of testing required to obtain the correct properties. Two projects, the NIST-sponsored Consortium on Casting of Aerospace Alloys and the DARPA-sponsored Investment Casting Cooperative Arrangement, focused on the modeling of casting processes. For these projects, the Metallurgy Division developed phase equilibria subroutines, which used a modified version of public domain software code, and constructed a thermodynamic database for Ni-based alloys. On the basis of these subroutines, programs were developed that perform equilibrium (lever) and Scheil solidification calculations for multicomponent alloys. UES Software, Inc., implemented these codes into ProCASTTM, a finite element method software package for the simulation of casting processes. 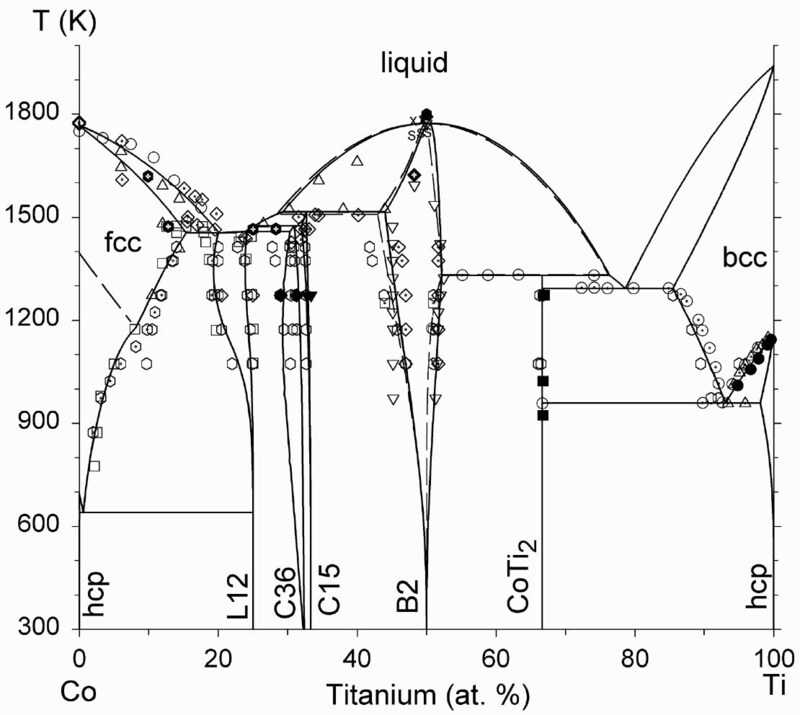 The original NIST Ni-superalloy thermodynamic database includes 9 elements, Ni-Al-Co-Cr-Mo-Re-Ta-Ti-W, and is based on critically evaluated literature work and NIST work on Co-Mo, Co-Ti, Co-Re and Re-Ti systems. Figure 1 shows the results of the assessment of the Co-Ti system. This database includes all known phases in this 9-component system. Recently, the description of the liquid, g, and g' phases were expanded to include Hf. Electronic versions of the NIST database have been distributed to various industries, universities, and national laboratories. As a result of this work, the detailed solidification behavior for Ni-base superalloys can be predicted. This has improved the quality of solidification simulations for investment castings, by providing more reliable predictions of casting defects, and thus allows industry to eliminate the need for extensive testing of many castings to reach an acceptable design. thermodynamics. The first step in modeling these multicomponent multiphase diffusion problems is the development of a multicomponent diffusion mobility database. This database is used in conjunction with the developed thermodynamic database to calculate the composition-dependent diffusivities for a given phase. As part of a General Electric-lead DARPA project for Accelerated Insertion of Materials (AIM), NIST is developing a diffusion mobility database for Ni-base superalloys. The NIST mobility database can be used in conjunction with the NIST Ni-superalloy thermodynamic database, as well as other commercial thermodynamic databases. The diffusion data in various constituent binary systems have been assessed to establish this multicomponent diffusion mobility database. The initial diffusion mobility database is focused on substitutional diffusion in the g (fcc) phase for the Ni-Al-Co-Cr-Hf-Mo-Nb-Re-Ta-Ti-W system. The mobilities determined for the self-diffusion of the components in the metastable fcc phase (where applicable) are consistent with the well-known correlation of melting point and diffusivity. 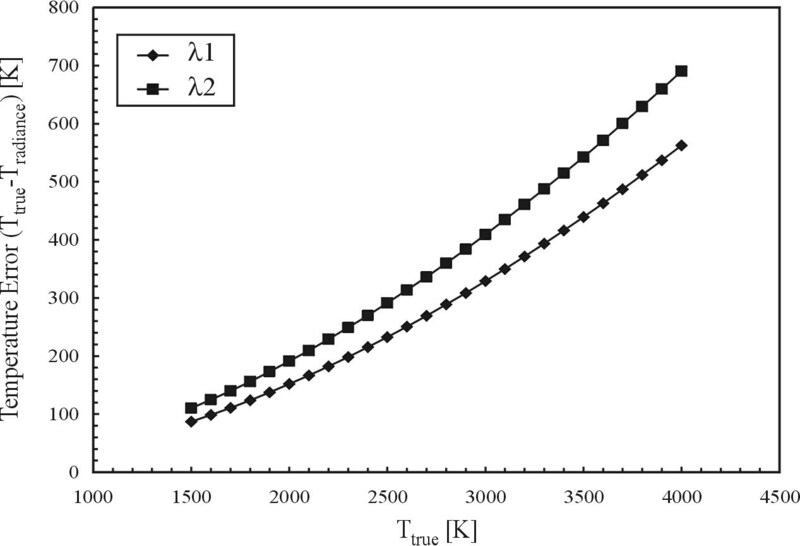 The general agreement of calculated and measured diffusion coefficients in the Ni-Co-Cr-Mo and Ni-Al-Cr-Mo systems demonstrates the validity of the database for the extrapolation to higher order systems. region with experimental results. Figure 2 shows the composition profiles predicted from a diffusion couple simulation using the current mobility database. Figure 2. 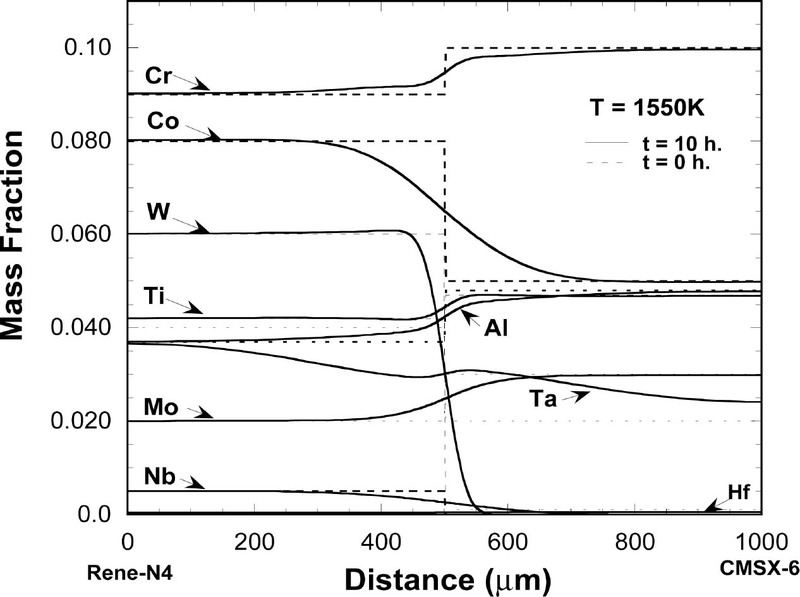 Composition profiles predicted for a diffusion couple of René N4 and CMSX-6 superalloys in the single-phase g (fcc) region at 1550 K for 10 h.
In addition to the prediction of diffusion profiles between commercial superalloys, an approach that combines multicomponent thermodynamics and diffusion is being utilized to determine the g' particle size and g' particle size distribution that is obtained after solidification and heat treatment. Also, diffusion simulations can be used to optimize the heat treatment schedules for cast superalloys to avoid incipient melting while minimizing cost. Further advancement of multicomponent multiphase diffusion simulations includes modeling the diffusion in the ordered g' phase and development of a more user-friendly electronic diffusion database for public use.  The 1998 Award for Excellence in Technology Transfer by the Federal Laboratory Consortium for "Transfer to the Aerospace Industry of Technology Developed for use in the Analysis of Advanced Casting Processes" (together with other researchers from MSEL and CSTL) .  The 1999 Department of Commerce Gold Medal and the 2001 TMS Bruce Chalmers Award were both bestowed on W. J. Boettinger, partly for his work in solidification research.  The paper "Thermodynamic Assessment of the Co-Mo System" was awarded the 2001 Alloy Phase Diagram International Committee Award for outstanding evaluation of phase equilibria data. "The efforts of NIST researchers on the Cast Aerospace Alloys consortium were instrumental in making solidification science available to the foundry floor. Their efforts on developing a thermodynamic database for Ni-base superalloys and coupling it with solidification pathway analysis, thermophysical property measurements, spurious grain formation studies, and solid/liquid interface sensors have significantly increased our understanding of solidification in the investment casing process. The success of these activities is paving the way for additional collaborations with important commercial benefit to Howmet."